Integral is the farthest reach of inter-disciplinary to date. It links "divergent" disciplines (such as the natural sciences, economics, politics, culture, psychology, and spirituality), including both the exterior (objective) aspects of life with the interior invisible (subjective and inter-subjective) aspects of individuals and cultures. In doing so, the integral approach provides a more comprehensive framework for analyzing problems and for crafting elegant solutions that more appropriately reflect the complexity of life. This makes the integral approach useful for understanding, and working with, the current eco-social issues prevalent in communities throughout the world. What follows is an overview of three key tenets of integral theory, with a final note on how these are brought together in an integral approach to social change and sustainable development. The integral approach weaves together the internal and external components of reality. 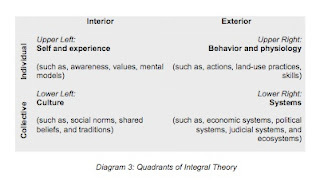 Alongside an understanding of the nature and complexity of interconnected systems, there is also recognition of interior dynamics (psychological, cultural and spiritual) in the system. An integral approach, therefore, retains the existing practices that focus on the "exterior" components of life, such as biological systems, economic initiatives, social organizing, governance and sustainability, and also works with the interior components, such as worldviews, values, and awareness. These interior parts of society inform our opinions and decision-making, essentially guiding the ways we make meaning of our surroundings and interactions. With an understanding of interiority, it becomes easier to identify the underlying values, needs, worldviews and motivations that arise when engaged in the work of social change. This enables a more effective working dynamic between and among individuals and communities, as well as more psychologically sophisticated way of collaborating with colleagues, staff, employees and project coordinators. Behavior and physiology (individual, exterior, such as physical health, actions, land-use practices. Self and experience (individual, interior), such as awareness, values, and mental models. Culture (collective, interior) like social norms, shared beliefs and worldviews, and traditions. However, this does not mean everyone must become an interdisciplinary expert. 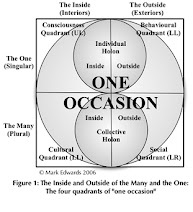 Rather, that from whatever discipline we are most familiar and comfortable, we still need to factor in and acknowledge the influence of the other quadrants. Often, organizations create diverse teams to cover a broad expertise across all quadrants, while also maintaining a view of the whole picture. Working with environmental or social issues is working with the on-going process of change. Deep, fundamental shifts in our ways of thinking foster visible changes in society, such as new institutions, management plans, laws and economic systems. But, new ways of viewing the world don't arise over night. Why and how do they arise? Integral Theory pulls together much of the developmental research that has studied that very question. What we find is that these emerging worldviews and values unfold in nested, developmental stages, moving towards the ability to hold multiple perspectives and thus a greater degree of care for others. Through childhood, adolescence, adulthood, and old age, this self-development actualizes the human potential within. While this is firmed based on extensive and empirical research in developmental psychology, we can simply look into our own experiences to explore this: if you think back to your own process of change, you can trace the inner shifts that have occurred throughout your life. Each emergent stage has greater complexity, awareness, and care than the former stage. Integral theory explains how fostering health in this "unfolding of complexity" is what is important, rather than trying to speed up the process of change. In fact, the latter can only happen once there is health in the existing developmental stage. For instance, nurturing a healthy expression of existing value systems is more important that trying to change those value-systems. Assisting with this healthy, full translation of the existing stage, can lay the emergent conditions for transformation to the next stage. But in either case, one must start with where people are at, helping to form a developmental pathway between the existing way of being to the emerging one. Thus, to truly engage in "awareness raising", which is a part of eco-social change work, one must be able to meet other people where they are, both in terms of their value-systems and their ways of making meaning. Communication with a developmental view is more connected and effective precisely because it can relate with where people are coming from, their worldview, values, and meaning making. This approach has immense implications in project design, community development, campaign messaging, as well as in fostering meaningful dialogue between sectors. Growth and change occurs differently in each quadrant. For example, in the UR quadrant, we need to know how the body's physiology changes over time and when it will have certain nutritional requirements at particular ages. In the developing world, this is crucially important, to ensure children are well nourished while they are at critical stage of physical development. In the UL quadrant, personal growth follows certain patterns as well that can be studied and included in social change work. Researchers have found clear stages of psychological development--from ego-centric, to socio-centric, to world-centric, to kosmos-centric--that give rise to different worldviews and awareness. Clearly, these two domains of experience change in very different ways, and it is important that we consider the differences in how we approach social change. Similarly, social change in the collective quadrants again is dramatically unique. Culture seems to change via predominant mode of discourse--what people are talking about and how they are communicating is essential to what the shared beliefs and worldviews will be. Historically, we have witnessed an unfolding of worldviews from animistic, to mythic, to rational, to pluralistic, to integral, woven into being via social discourse. Systems too have followed their own change process. The socio-economic systems, for example, can be looked at historically, moving from hunting/gathering, to horticultural, to agrarian, to nation-state, to industrial, and to informational systems. The Integral Approach suggests that finding long-lasting solutions to global issues will involve a deeper understanding and engagement in change processes in all four quadrants. 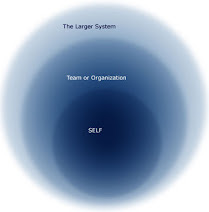 By seeing individuals and the collective as distinct but inter-relating wholes, it becomes easier to identify the root causes and possible solutions for problems that arise within organizations, groups and communities. Examples include communication break-down, management dysfunction and clashes between differing worldviews. Integral theory can be applied in various ways in social change and sustainable development. An understanding of interiority and developmental unfolding in individuals and the group provides for more comprehensive project design, strategic planning and problem solving. For more, continue with integral applications. Drishti was founded in February 2003, with a vision for transformational environmental and social change. As we founded Drishti, we looked at the constellation of global issues that humanity faces and poised our work to address them. We saw that the issues were not exclusively addressed in just one thematic area nor by using one angle of approach. Rather, the complexity of issues seemed to require a more comprehensive approach. We have sought to explore such comprehensive approaches, one prominent approach being the Integral Framework. At that time, Integral Theory remained mainly a theory, yet we saw its extraordinary potential in sustainable development. Drishti became a vehicle to explore that potential through research, writing and community conversations. Since then, aspects of an Integral Approach has been applied in numerous fields, such as health care, business, psychotherapy, education, and notably in sustainable development. Some of the organizations that have used Integral Approach in development work include the United Nations Development Programme’s HIV/AIDS Group, various NGOs in Latin America, and community groups worldwide. Please see the Resources page as well as Links to read about Drishti’s and other organization’s applied work with the Integral Approach in fostering sustainable development.